It has been my conviction for some time that the “perfect storm” which underlies the current obesity epidemic was the marketing of novel food products that were a combination of refined carbohydrates and manufactured vegetable oils and today I came across evidence that the food industry has known for some time that this specific combination results in significant weight gain. The proof wasn’t in a remote journal article, but in a product that was deliberately designed from refined carbohydrates and manufactured vegetable oils and marketed for the specific purpose of causing weight gain. Yes, you read that correctly. Just 5 years after the first manufactured vegetable oil product, Crisco® was created in 1911 — the brainchild of soap manufacturer Proctor and Gamble, a product called Wate On® was created by Dendron Distributors  of Chicago, Illinois in 1916 and promoted to doctors and the general public to promote weight gain through its “proven weight building elements”. Wate On® boasted in magazine and newspaper ads that it was “loaded with concentrated calories so prepared to be far easier to be used by the system in building wonderful body weight“. So what was its specially prepared formula? It was the combination of vegetable oil and refined carbohydrates with added vitamins and minerals together in one easy-to-take product. Wate-On®’s formulation was no secrete and was published in their advertisements. 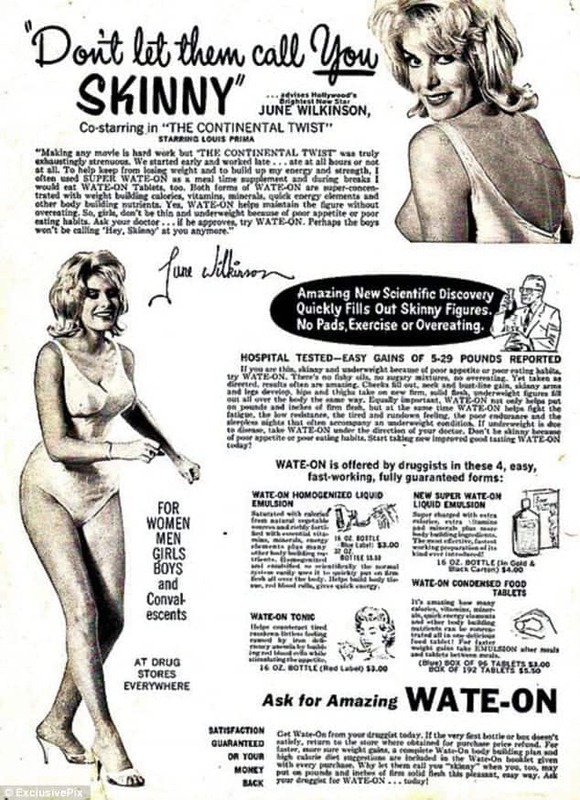 Actress June Wilkinson, in an ad from the early 1960s in referring to the two formulations, WATE-ON® and SUPER WATE-ON® writes”both forms of WATE-ON are super-concentrated with weight-building calories, vitamins, minerals, quick energy elements”. In other parts of the same ad, it lists that the product is “saturated with calories from maize oil” and that SUPER WATE-ON has “extra calories from energy-giving sucrose and easy-to-digest vegetable oils“. The obesity crisis should have come as no surprise. 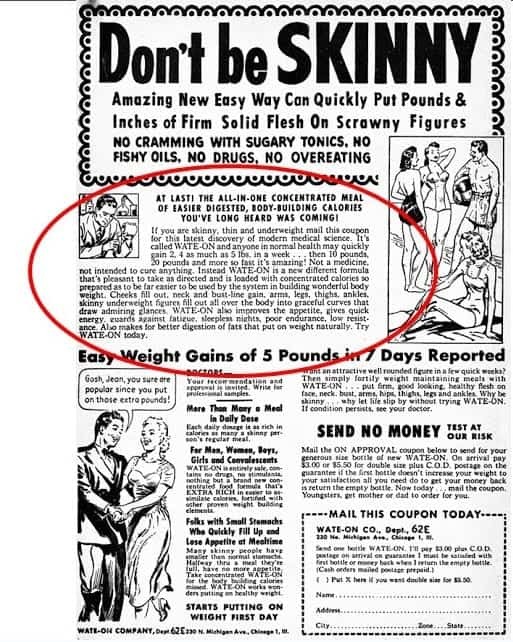 In the 1940s, 50s and 60s, manufactured vegetable oils combined with sucrose (the refined carbohydrate of table sugar) were sold and promoted for weight gain. In August of 1967, Stare, Hegsted and McGandy – the 3 Harvard researchers paid by the sugar industry published their review in the New England Journal of Medicine — which vindicated sugar as a contributor of heart disease and laid the blame on dietary fat and in particular, saturated fat and dietary cholesterol. This vilification of saturated fat laid the foundation for the food industry to promote their novel vegetable fats to the general consumer as a ‘healthy’ alternative to ostensibly ‘unhealthy’ saturated fats. …and promote them they did! In the late 1980s, the food industry marketed their manufactured vegetable fats to an unsuspecting public by providing “teaching resources” to future Dietitians to promote their products as “healthy oils”. I know. I was one of them (more in this article). Then came the proliferation of manufactured “convenience foods” and “fast foods” — sold as products to make life easier, but which made us fatter instead. These products were (and are) the very combination of manufactured vegetable oil and refined carbohydrates of which weight-gain products of years-gone-by were made from! Can the food industry claim — like the tobacco industry before them that they didn't know fast food and convenience food would result in ill health, stemming from overweight and obesity? I don't think so. 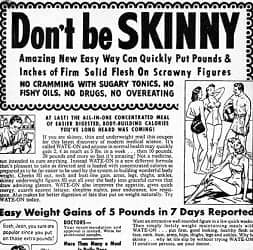 The food industry knew that the combination of manufactured vegetable oil and refined carbohydrates would lead to weight gain because before they were sold together as ‘convenience food’ and ‘fast food’, they were sold together in products deliberately designed to promote weight gain. I remember when when the tobacco industry was challenged and how very long it took before a final verdict was reached and marketing and selling of disease-causing tobacco products to the public was legislated. How long will it take for foods containing a combination of manufactured vegetable oil and refined carbohydrates that we KNOW cause weight gain, to be likewise legislated? How many more millions of people will die from food-related death or live poor quality-of-life due to obesity and obesity-related metabolic disease before the food industry is challenged? Having read this article, I would encourage you to begin reading labels of the foods you buy — and see how many of them have this combination of manufactured vegetable oil and refined carbohydrates. Start with ones in your pantry or fridge, then begin to read labels before you purchase them. The manufactured vegetable oils to look for are mainly soybean oil, canola oil and corn oil [also called maize oil in imported products] and the refined carbohydrates can be anything from white flour to various types of sugar (sucrose, glucose, other words ending in —ose). Then, look for healthful alternatives available in the marketplace. Monounsaturated fats such as olive oil and avocado oil are great alternatives and many of the products that have added sugars and vegetable oils really don’t need them, such as salad dressing or peanut butter. Finding healthy products rarely requires shopping at a “health food store”, but simply shopping wiser at an ordinary supermarket — and realizing the the products you and others buy are the ones that stores will restock. If your store doesn’t have a healthy alternative to a product, then ask to speak to the department manager to request that they stock some. When you have some time, ask for the ingredient list to the products you buy at your local fast food restaurant or coffee house — or go online and find them. By law (in both Canada and the US), food service companies are required to make these available. Ask. Read them. Look for they types of fats that are used and the types of refined carbohydrates. Then, make food purchases for yourself and your family based on what you know and what you learned in this article about products that contain a combination of manufactured vegetable fats and refined carbohydrates. If you need help to make healthier food choices, I can help. Please send me a note using the Contact Me form located on the tab above and I will reply soon. Copyright ©2018 a division of BetterByDesign Nutrition Ltd.